On The Island Of Lanzarote Chefs Cook Food Over? The Roche Limit Is A Mathematical Formula That Explains? On the island of Lanzarote, a Spanish island located in the Canary Islands chain off the coast of Morocco, there is a small restaurant named El Diablo. The restaurant is located in the foothills of the Fire Mountains which are in turn located in the rocky and barren Timanfaya National Park. What makes this restaurant so unique and worth the trek out into the otherwise unpopulated national park? The method of preparation. The Fire Mountains were created in the early 18th century when a sudden spate of volcanic activity on the island pushed up hundreds of small volcanic mountains. Although the volcanoes are now dormant, there are still vents where their simmering heat is expelled to the surface. El Diablo is built over one of those vents such that the chefs can directly harness the power of the volcano and grill over the heat. 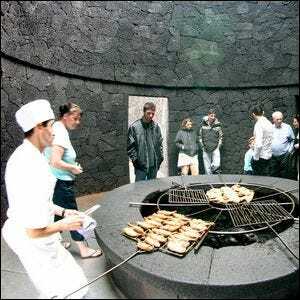 The main grill station in the restaurant is actually a giant open-top basalt chamber built to the specifications of a team of architects who worked with volcanologists to safely harness the heat of the volcano vent which in turn offers restaurant patrons not just a unique dining experience but, courtesy of the tours, a great photo opportunity. Image courtesy of Montserrat Labiaga Ferrer.